I’ve been a news junkie since I was a boy. My first job in a suburb of Boston was delivering The Boston Globe, The Herald Traveler, and for a handful of discerning readers, the Record-American. Eighty or so newspapers on a bike, long before I started driving a car. There was another guy in the neighborhood who delivered the Patriot Ledger in the afternoon. My father worked in the Mailers’ Union for the newspapers. When I was in high school, right across Morrissey Blvd. from the Boston Globe, he got me a few shifts on Saturday nights putting the Sunday papers together at The Globe. That was back when the Sunday newspapers were gigantic. When I went on breaks, I enjoyed reading the paper in the middle of the night, before anyone else had an opportunity to. I did well at writing in high school and I took writing classes in college. One of those courses was Magazine Feature Writing at the University of North Florida. That class was taught by the incomparable William Roach. Students in that class had to go through the process of writing and submitting four articles to magazines. One of mine got published! It was a thrill to see my name in print. I went on to write book reviews for the Florida Times-Union and numerous articles that were published in excellent magazines like Onyx, The Wittenburg Door, and National Business Employment Weekly. In the 90s a friend of mine who was in radio ran for Congress and I got involved with his campaign. During that time I read dozens of books about the media. I was trying to learn enough to become the logical pick for press secretary if my friend won. Unfortunately, he didn’t win. I had accumulated so much information that I felt like I had to do something with it. By that time, lots of Americans loathed the media. Trivial Pursuit was hot. I created a trivia game called Media Mayhem, the game that empowered people to trash the media, piece by illicit piece. I intended for it to be a fun way to learn about the media. Although the game didn’t sell as well as I would have liked, I did manage to get on over fifty talk radio shows throughout the country as a guest to talk about it. I’ve never stopped being a news junkie. I still get two newspapers – the Wall Street Journal and the Florida Times-Union – delivered to the end of my driveway every morning. (Actually, the WSJ doesn’t publish on Sundays or holidays.) Also, I’ve continued to write for publication. Toward the end of 2016, it seemed to me that there would be a serious need for informative articles and blog posts to educate people about fake news. I wrote blog posts on topics like How to Spot Fake News, Pizzagate, Buzzfeed, Alternative Facts, and more. To lighten things up, I also wrote fake news about fake news. Those posts include titles like Fake News Announces it will Develop a Code of Ethics, and a post about the fictitious Fakies Awards. I believe that humor and satire can be very effective for making points about serious subject matter. 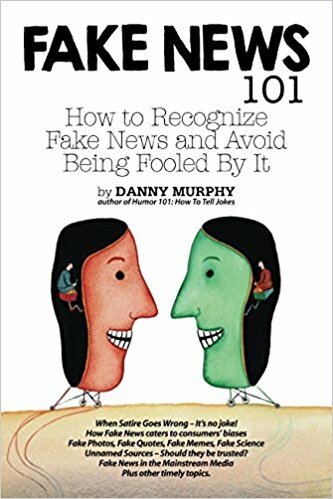 Check out the book, Fake News 101, at Amazon.com. As a former reviewer of books, I can assure you that it will be well worth your time.